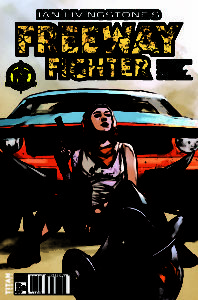 Pullbox Reviews: Freeway Fighter #1- Max who? On Sale May 17, 2017! 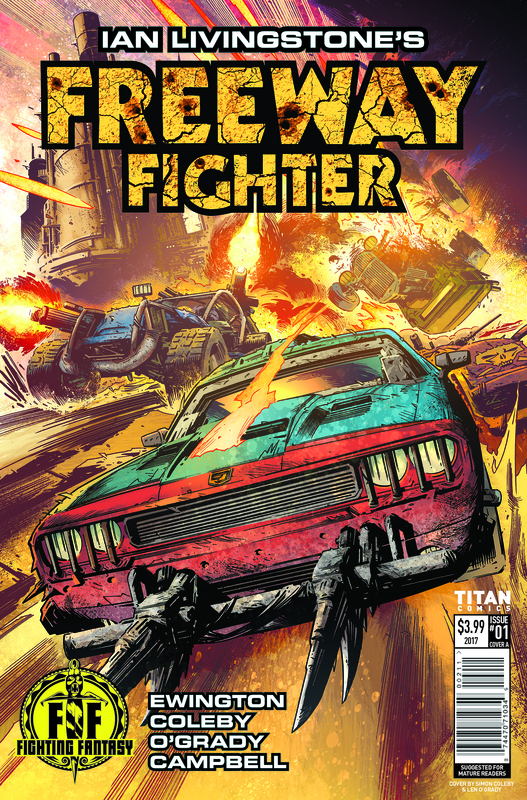 Critically acclaimed writer Andi Ewington (Just Cause 3, The Six) teams up with original creator Ian Livingstone and artist Simon Coleby for FREEWAY FIGHTER – a furious, four-issue road trip like no other, speeding from Titan Comics in May 2017. Spinning out of the legendary Fighting Fantasy series of gamebooks created by Ian Livingstone and Steve Jackson in 1982, the post-apocalyptic Freeway Fighter distinguished itself by deviating from the usual mix of orcs, goblins and cave- trolls. Celebrating 35 years in 2017, Fighting Fantasy brought together choice driven storytelling with a dice-based role-playing system to create a world in which “YOU are the hero!” The series sold over 18 million copies worldwide and is translated in over 30 languages. 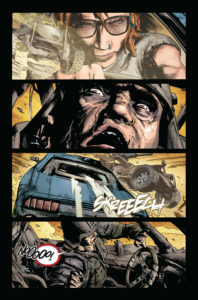 In the new comics series, an unknown virus has wiped out over 85% of the world’s human population. Former I-400 Driver Bella De La Rosa is one of the 15% – living every day as if it were her last. 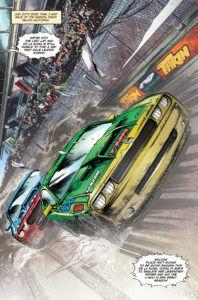 Now, eighteen months after the collapse of civilization, faced with a new world order where violence and chaos rule the Freeway, she must hone her racing skills and survive any way she can! Bella De La Rosa is in the last few laps of her rookie season as a race car driver. Doing her best to prove that she’s deserving to carry on the legacy of her legendary father, she’s aggressive and fearless. Both are fine traits to have in the world of high speed racing. They’re even better traits in the post-apocalyptic world that follows. Jump ahead to the year 2024. The plague that wiped out most of the world’s population has left an empty husk behind. Towns sit empty and the highways and byways have become battlegrounds as the survivors fight over the scraps. Bella is still behind the wheel of high powered machine, with a few extra modifications, but instead of driving for fortune and glory, she’s driving for her life. 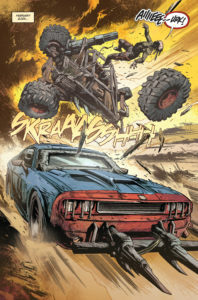 Freeway Fighter doesn’t waste any time getting down to the tire squealing, bone crunching brass tacks. 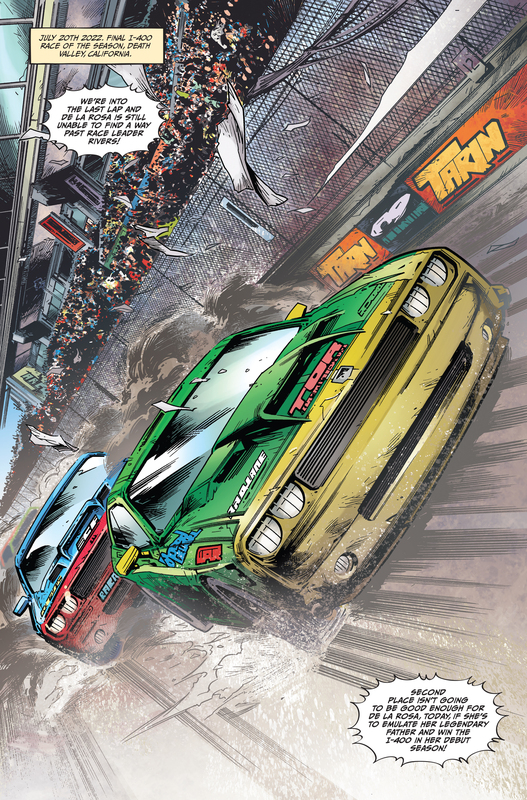 In the introduction, we’re shown Bella in what is probably her last officially sanctioned race. From there, we’re thrown ahead into the wasteland where her skills and instincts are serving her well. On the racetrack, she might’ve been a little on the hot-headed side. In the post-plague New World Order, her willingness to punch the gas and let her heavily reinforced spiked bumper do the talking serves to keep her on the go. Unfortunately, she isn’t the only driver on the roads. Packs of survivors, all sporting armed and armored vehicles that would make Max Rockatansky proud, scrounge the remains of civilization for whatever they can find, use, or trade. As a kid, I was all into the post-apocalyptic world introduced to us all by Mad Max, its sequel The Road Warrior, and stories like Alan Dean Foster’s “Why Johnny Can’t Speed”. Out of that formula, games like Steve Jackson’s Car Wars (1980) were born. In 1985, Ian Livingstone published his game Freeway Fighter with Puffin Books. 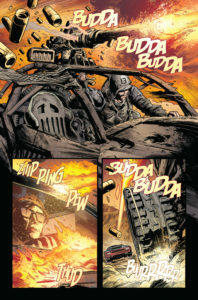 In 2005, Wizard Books brought two role-playing powerhouses together, with Freeway Fighter featured prominently in the series. 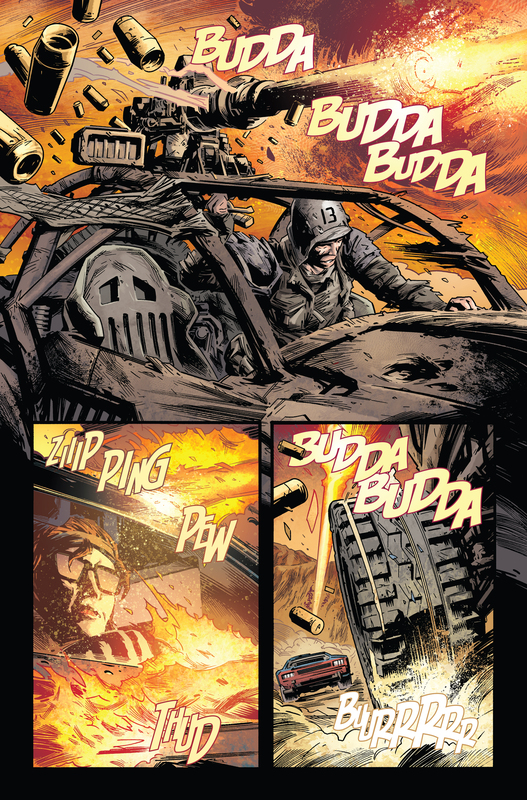 Now, still under the Fighting Fantasy label, Andi Ewington, Simon Coleby, Len O’Grady, and Jim Campbell have recreated Livingstone’s gritty petrol-fueled world in comic book form. The opening issue gives us relatively few words to go by, but with the world’s population reduced by 85%, how much idle chitchat can you expect? 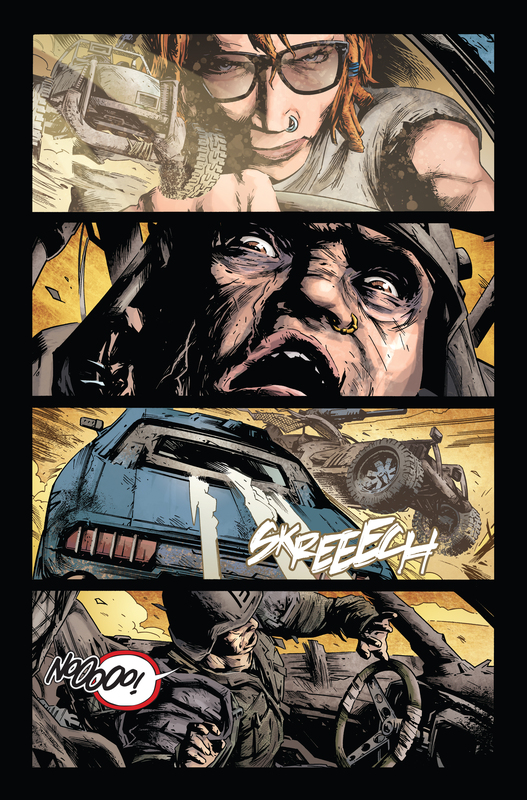 Most of the dialogue is a one-way conversation between Bella and her heavily armored race car, whom she lovingly calls “Baby”. It makes sense in the context of Bella’s world. We’re usually closest to the people we rely on the most, and with road bandits looming large in her rear-view mirror, who would she rely on more than her car? 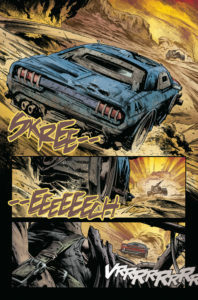 Bella’s character is shown through her actions more than her words, first in her no-nonsense “bumping is rubbing, and rubbing is racing” approach on the track, and later in her ruthless tactics in the desolate wasteland. When you have to fight and scrape for every bit of food, every liter of gasoline, you can’t think twice about using whatever you have at hand to keep what you’ve got. In Bella’s case, that includes the use of a tire iron for the up close and personal encounters. The action is very much in keeping with the source material. Vehicles that used to be mere methods of transportation have now been outfitted with machine guns, steel spikes, and armor plating. Driving fast, and doing it well, are the keys to survival and when crashes happen, they are spectacular. 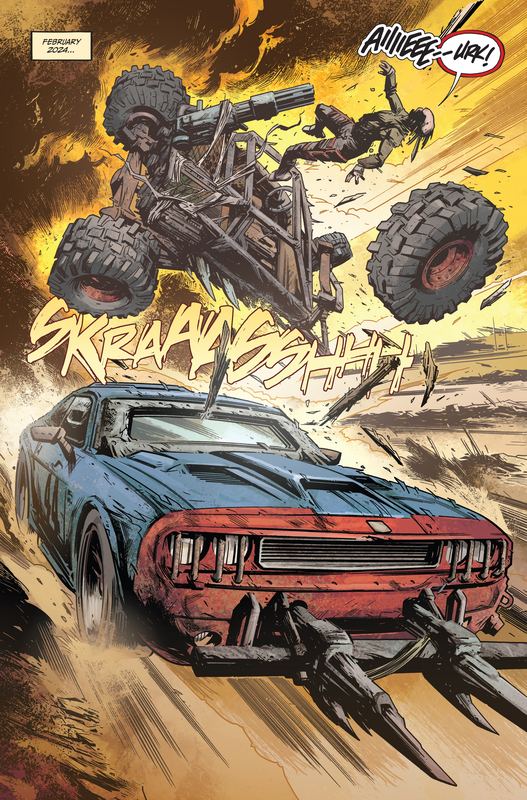 The combination of Coleby’s art and O’Grady’s colors bring that kind of world to life. We see it in the lines on Bella’s face as she whips around in a 180 to challenge her pursuer’s to a deadly game of chicken. In most comics, I largely ignore the “sound effects”. 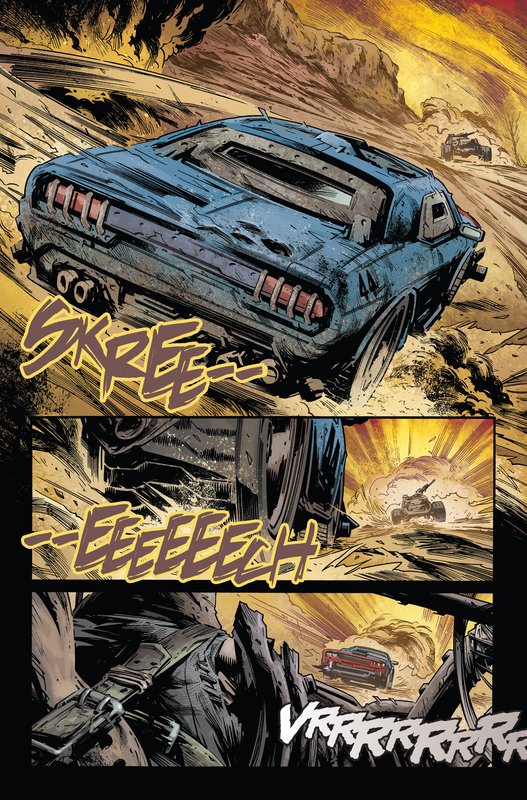 In Freeway Fighter, Campbell’s job as letterer is pushed out into the forefront to give the high speed chases and resultant crashes a little extra impact. 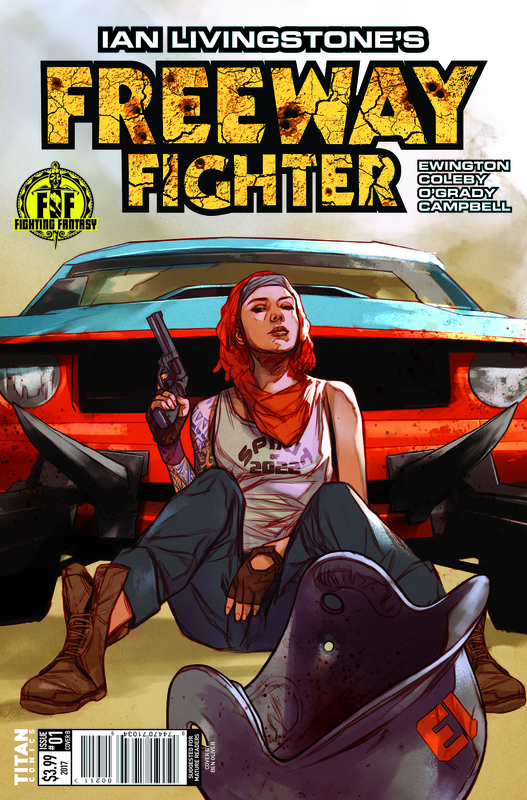 In its opening issue, Freeway Fighter has introduced a world that’s gotten to be pretty familiar, and in recent years has experienced a bit of a revival. There’s something very appealing, in a purely juvenile kind of way, about the whole post-apocalyptic story. Sometimes the survivors have to contend with zombies, sometimes it’s cannibalistic mutants. Sometimes, the inner child comes together with the id, and we get the high speed, high impact kind of action that only something like Freeway Fighter can provide. The Steve Jackson (US) of Car Wars is not the co-creator of Fighting Fantasy. Wizard Books did not bring Steve Jackson (UK) and Ian Livingstone together; they co-wrote the first Fighting Fantasy gamebook, The Warlock of Firetop Mountain, published by Puffin Books back in 1982. My mistake, Jonathan. Anything inaccuracies in the article weren’t meant as a deliberate attempt to mislead, and I appreciate the info.